We are committed to always offering competitive pay, a well-maintained fleet and guaranteed home time. Our Drivers Come for the Flexible Routes, Good Pay and Quality Equipment. We are committed to always offering competitive pay, a well-maintained fleet, and guaranteed home time with a compassionate approach. Pay starts at 40CPM for all drivers w/ 2 years’ experience and a clean MVR. Dedicated routes pay as high as 46CPM depending on length of haul and time with company. Percentage-based pay for any irregular load board freight. We want our drivers to want the same thing we want – the highest-paying load. Fuel bonus as high as $100/week depending on equipment, weight and lane terrain. 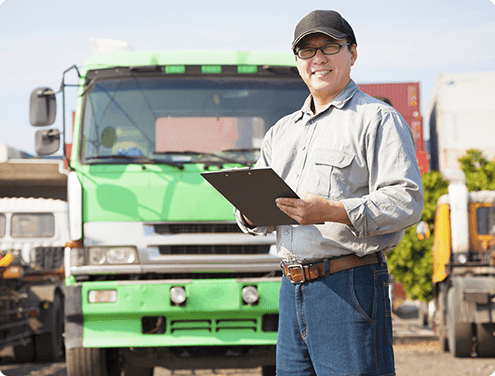 Safety bonus of $100 for clean DOT inspections (level 1, 2, or 3). Driver referral bonus of $500 for anyone who stay 30 days or more. $20/hour detention pay for any holdovers more than 2 hours past the end of a scheduled apt. time – regardless if the customer will pay us for it or not. $300 layover pay for unplanned 34-hour restarts on the road. 1-week holdback period (you get paid this week for what you did last week). Simple settlement with no line-item deductions. We have runs to fit any preference – home every night, every 2-3 nights, every week, or more. Our strategic focus on just-in-time automotive customers keeps schedules consistent. Company policy is to always honor requests for time off with 10 days’ notice. Honest and empathetic dispatch that will never leave you stranded while on the road. Family-owned and operated since 2008. Management team includes the owner (George), a former small fleet owner, his wife (Joy), and son (Alex). We accommodate family situations that may prevent drivers from running certain schedules. Friendly dispatch team that completely understands that the drivers are our heart and soul. A true driver-first mentality. It’s not just a marketing tactic, our driver-first mentality is the strategic choice we make that differentiates us from the competition. We eat, drink, and breathe that strategy. All driver suggestions are sincerely considered. We always want to hear their ideas on how we can improve our performance. Experienced load planners intimately understand how 'Hours of Service' work and intelligently plan routes that keep you moving and minimize downtime. Company policy to be brutally honest with drivers whenever possible – no sugarcoating or misleading people to get their loads covered. We won’t set you up for failure or coerce you into anything. You will be able to make a decent paycheck without bending hours of service regulations. Open door policy means any question is fair-game, at any time, for anyone in the company. Average equipment age is less than 3 years. All other drivers will receive equipment model year 2015-2017 (Freightliner Cascadia, Kenworth T660/T680). Our In-house maintenance shop allows you to schedule PM's and other service at your convenience – no waiting on the road at a T/A. "I always drove new and well maintained equipment. They were the largest trucking company in North America and I was never short on hours to work. I also had a great driver manager!" -Tom S.